Do you struggle with self-confidence in your everyday life? If you find it hard to be assertive, whether at work or home, due to confidence issues, now’s the time to take a stand. Live Bold and Bloom offers an online course in self-confidence. 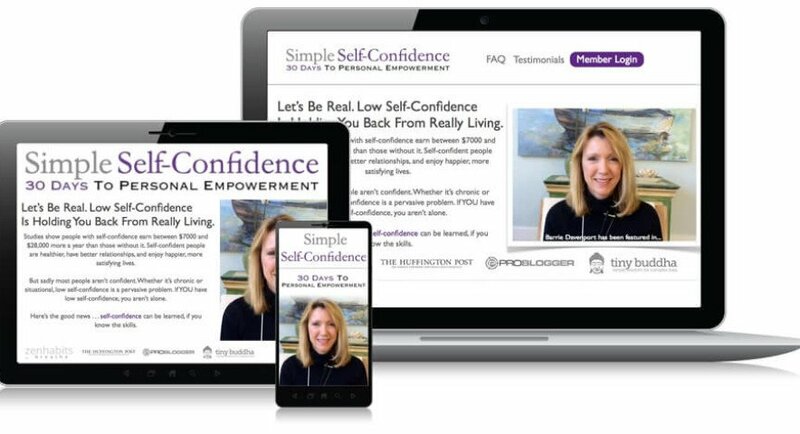 The lessons are self-paced, which means that even those with a busy lifestyle can find time to improve their confidence and take control of their lives. By working through each video, audio lesson, and worksheet, you will learn the skills necessary to improve your confidence. The guided meditations will help you relax, while the daily affirmations will send messages of confidence past your conscious brain and embed them deep into your subconscious for maximum, long-lasting effect. One great thing about this course is that it’s aimed at anyone who struggles with self-confidence, whether in the workplace or in their personal lives. Almost anyone could benefit from a boost in self-confidence, but the real benefit is for those whose lifestyles are negatively impacted by their inability to stand up for themselves. This self-confidence course can give you the strength to speak up against workplace bullying and harassment, and even ask for the raise you know you’ve earned over the years. Taught by a trusted and experienced confidence expert who’s been recommended by such reputable sources as Huffington Post. Online, self-paced format is perfect for both the dedicated go-getter and those with notably busy schedules. Comes with both videos and workbooks, which means that it caters to multiple learning styles. Those with a hard time self-motivating may find it difficult to stay on task with the assignments and accomplish their goals. Unlike in a traditional classroom environment, the teacher isn’t right in front of you to keep you focused or to ask questions to if you’re confused. The key benefit of Live Bold and Bloom is the boost in confidence you may see in as little as 30 days. Increased self-confidence means the ability to ask for what you want in life and advocate for yourself and your needs, leading to a higher quality of life overall. The course offers a lifetime subscription to the lessons, which not only allows for users to go at their own pace, but also means that the lessons can be revisited at any time. However, dedicated students could conceivably complete the course in about a month. Reviews of the course are largely positive. Participants mention that the lessons felt safe, comfortable, and warm, and that Barrie Davenport was a good teacher. Barrie Davenport herself inspires confidence with years of experience. She’s written for such prestigious places as Huffington Post, which lends credibility to her name and her lessons. Unfortunately, though reviews were positive, none cited specific examples of how the program actually helped them, which makes it hard to know the programs effectiveness. There is a one-time payment of $147 for the course, with a 30-day money-back guarantee for dissatisfied customers. Considering most colleges charge hundreds of dollars for similar courses without the benefit of a self-paced environment or a money-back guarantee, it’s a pretty great deal.